Using that entrance, follow the road in and at the, “T”, make a right which is 13th street. Follow that around to another, “T”, which is 12th street and make another right. Drive down a bit and you can park next to the fence before or around the bend in the road as 12th Street turns East into, ‘A’ Street. From there, Summer is around the third row of trees from 12th street and the third tree in from ‘A’ Street. If you still can’t find her, give me a call and I can help. 602-312-6504. 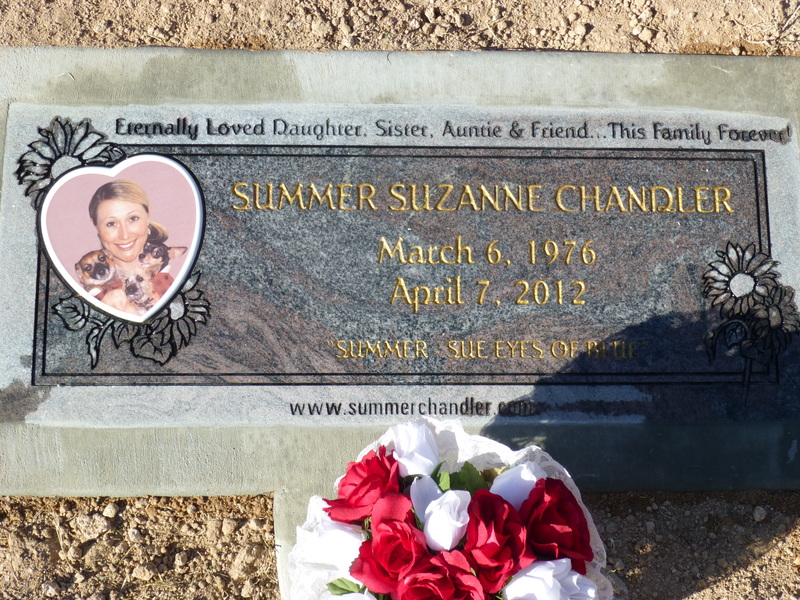 Here are some pictures of her fancy new headstone. On Friday, I replaced the Christmas Poinsettias that Verletta, Scott and Traci placed there with a new bouquet of red and white roses. Someone left a single red rose….thank you. On Saturday, 1/12/13, Bob and Michelle brushed away the dirt from the new monument setting and took great pictures. Now people can see Summer’s smile when they visit. Please let friends and family know the headstone is now in place. Kristi says she likes the sunflower design. Went to visit Summer’s gravesite Saturday, May 11, 2013, day before Mother’s Day. Just wanted to celebrate with her and thank her for choosing me to be her mother. I cleared her headstone and had a Wendy’s lunch with her. Then, on Wed 5/15/13, went to the Mesa Temple and did an endowment session. Again, I sat on the front row and no one sat to my right but filled up the rest of the seats. This happens 95% of the time I attend the Temple….I think my sweet Summer is sitting to my right because she is left handed. I put out my hand to hold her’s and imagine sweet visions and words she would say if she were there. It will be interesting to discuss this with her in heaven.